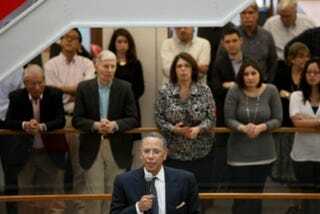 Dean Baquet addresses the New York Times staff in the newsroom May 14 after he was named executive editor. "I Identify with People Who Don't Have Much Power"
Dean Baquet, the first African American top editor at the New York Times, does not talk much publicly about race, but he says that he owes his job to the black journalists who came before him and that his own background makes him "want to make sure news organizations like mine question power and cover the poor." Baquet responded by email to a message from Journal-isms on the same day that NPR aired an interview Baquet gave to reporter David Folkenflik. There, the new executive editor denied that gender issues were behind the firing of his predecessor, Jill Abramson, but agreed that he was more than a passive bystander in her exit, made public May 14. Baquet was managing editor, the No. 2 newsroom job. In last year's newsroom diversity census of the American Society of News Editors, the Times reported 0.1 percent American Indians; 7.0 percent Asian Americans; 7.8 percent blacks and 4.1 percent Hispanics, for a total of 18.9 percent journalists of color. Baquet has disappointed those who have looked to him to become a beacon of diversity hiring, and he did not respond to a question about how much of a priority diversity would be under his editorship. However, Baquet said of black journalists who toiled earlier at the Times, "I owe my predecessors a great debt. I recently wrote Paul Delaney a note saying I wouldn't be here if people like him had not come before, and proven themselves as journalists who belonged at the best news organization in the country." He was referring to the former senior editor at the Times who is a founder of the National Association of Black Journalists. "My task was easier because of people like that, most of whom I haven't met because they left before I got here. But I understand their role, and [I'm] deeply indebted to them." Baquet also wrote, "How has my background as a black man from the South, who grew up in black neighborhoods and attended black schools until college affected my journalism? "First off, I identify with people who don't have much power. I know that's hard to believe, coming from someone who edits a powerful news organization. But my father was a mailman for 15 years, until he quit to open a neighborhood restaurant. We lived in an apartment in the back. I did not grow up with much money. That's the world that made me. "I want to make sure news organizations like mine question power and cover the poor. The story of Detroit is important to me. The story of post-Katrina New Orleans is important. The Dasani story affected me deeply. I want to make sure The Times continues that kind of coverage." In December, the Times ran a series called "Invisible Child" by Andrea Elliott about Dasani Coates, an 11-year-old homeless girl. Some commentators considered it Pulitzer Prize-worthy, although it did not win that honor. Baquet is a New Orleans native. Folkenflik, too, asked Baquet about race. "It's something I don't talk about a whole lot for tons of reasons. But I'll talk about it now," Baquet said. "First off, I think it's gotta be a great inspiration for young African American journalists all across the country. And that makes me feel great. And I need to spend more time talking to them and talking to them about how I got there." Baquet added, "My racial and economic background influences the way I think about coverage and news." Folkenflik wrote, "In his first public comments on the matter, Baquet told NPR that Abramson was fired because of her failed relationship with [Publisher Arthur O.] Sulzberger [Jr.] and with senior editors — especially himself.
" 'It's hard to run an organization if you are at odds with the publisher, with your leadership team, including your number two,' Baquet said in a wide-ranging interview lasting roughly an hour. 'Obviously, there was a significant disagreement between Jill and the publisher, and Jill and me.' "
Folkenflik also wrote, " 'In the interview, Baquet confirmed that he had bluntly told Sulzberger of his dismay at her intentions to bring in another chief deputy and he acknowledged that those actions helped lead to Abramson's firing. But Baquet also said he gave no ultimatum. "In recent days, Baquet has taken to calling Times reporters and editors to calm them down and seek their expertise.
" 'I don't think it's any secret that my rise to be executive editor was preceded by a period of turmoil,' Baquet said. 'One of my first jobs is to make sure that the turmoil which was inevitable doesn't get in the way of what The New York Times does best. So I want to hear from people if they have suggestions for how I can do it.' . . ."
In a series of tweets reported Friday in the Black Alumni News of the Columbia School of Journalism, Lydia Polgreen, a deputy international editor at the Times, seemed to agree with Baquet on the reasons Abramson left. "One telling fact: the women of the Times would revolt en masse if they thought gender played any role at all in Abramson’s firing," one Polgreen tweet read. A front-page story in the New York Times this week reaffirms that well-meaning stories in the mainstream media about African Americans sometimes earn criticism instead of applause. The subject was "The Dark Room Collective: Where Black Poetry Took Wing," an upbeat story on Tuesday about contemporary black poets by Jeff Gordinier, a white reporter in the Dining section who has written about poetry, film, music and other cultural topics. As Gordinier explained by email, "The article . . . came about because I happened to have lunch with Mary Suh, an editor in the culture section. She knows that I am an avid (some would say obsessive) reader of poetry, and she asked me what I thought deserved coverage in the paper — what the Times had been missing. "Right off the bat I said something along the lines of, 'This is an amazing moment for African-American poetry, there's just an incredible amount of great work being written, and I think it deserves more attention.' Boom. That was it. I have written about poetry for the Book Review and Travel sections of the newspaper, so Mary decided to give me a shot at covering this for the culture pages, perhaps because she could sense that I was passionate about it. . . ."
The reaction, as recounted by email by Ishmael Reed, the poet, novelist and essayist: "Black intellectuals, critics, writers including leading black critics [names omitted] and even some of those interviewed in the article are furious . . . It was written by one of the food writers, which shows the disrespect that the Times has for black lit. which is admired the world over. "When I visited Kyoto, I found a Langston Hughes club, and a conference in African American literature held in Paris drew scholars from all over the world. The point of the article was that black poetry has 'evolved' from a tradition that was all about strife. Ludicrous and stupid. In my correspondence with the writer that was begun yesterday, I found that he hasn't the slightest idea about black lit. tradition and was winging it. . . . the major African American critics have never appeared in the Times. They would never assign a food writer to white lit." Another poet, Howard Rambsy II, assistant professor, Department of English Language and Literature at Soouthern Illinois University at Edwardsville, said by email, "the article comes off as the literary equivalent of saying that these are the first 'articulate' and 'clean' African American poets, analogous to how some white people described [Barack] Obama in relationship to supposed inarticulate and non-clean black politicians. . . ."
"1) The New York Times has no serious interest in the functions of poetry in contemporary American culture. Otherwise, the newspaper would have assigned the story on the Dark Room Collective to a writer who has proven knowledge about American history and literature. "2) Jeff Gordinier is not a critic. He is a reporter. "3) The article expresses liberal contempt for the history of African American poetry. It ignorantly suggests that black poetry was limited to stylistic treatments of 'strife or racial identity.' Were I ignorant, I might say Ezra Pound never engaged strife in his odes and Elizabeth Bishop was not capable of conceptualizing her racial identity. "4) The article conveys the impression that poets not associated with either the Dark Room Collective or Cave Canem are beneath the dignity of attention." For his part, Gordinier cites his past work and interest in black poetry. "Do I wish that we had had more space in the story to acknowledge the decades and decades of fine work that led up to the Dark Room and Cave Canem breakthroughs? Absolutely," Gordinier wrote Journal-isms. "Some readers seem to be coming away from the article with a feeling that it puts the generations at odds with each other, but I don't see it that way — I always saw this evolution as a passing of the torch, and to me the article conveys that." Gordinier continued, "I know that people often say things like this, when disputes arise, but I am happy to see that more people have been talking about African- American poetry this week. Sadly, of course, that national conversation has been inspired in large part by the passing of Maya Angelou, whose work transformed lives. "But I guess I always see it as a good day when people are talking about poetry." Monica C. Lozano is stepping down as publisher and CEO of La Opinión, the nation’s largest Spanish language daily newspaper, and as senior vice president of newspapers for impreMedia LLC, overseeing the company's publications group, impreMedia announced on Thursday. Los Angeles-based La Opinión was founded by Lozano's grandfather in 1926 and has been led by a Lozano for more than three generations. ImpreMedia was acquired by Argentina's La Nación In 2012 through its subsidiary, US Hispanic Media Inc.
"She will remain as Chair of the Board of impreMedia’s parent company, US Hispanic Media Inc.," an announcement said. "The move will enable Lozano, who has been in the leadership of impreMedia or its predecessor properties for nearly 30 years, to pursue new career interests. ImpreMedia’s Chief Operating Officer, Francisco Seghezzo, will become CEO of the company effective June 1st. . . ."
Lozano said in a news release, "I've spent almost 30 years with this company and want to take on new challenges. I'm extremely proud of all that we've accomplished at impreMedia, but there are times in one's career when change feels right. With Francisco's capable leadership and proven track record of success, this transition comes at the right time with the right person in place. I'm eager to pursue other opportunities that are ahead. Retaining my role as Chair of US Hispanic Media Inc. while I explore those opportunities is a prospect that I relish." Conservative commentator Armstrong Williams challenged the Federal Communications Commission in court Friday, a day after Sinclair Broadcast Group, the nation's biggest owner of TV stations, told the FCC it is surrendering the licenses for three of its properties after an FCC rule change. Sinclair's move meant that Williams, who had planned to purchase stations in Charleston, S.C., and Birmingham, Ala., from Sinclair, could not do so. It would be the third television station that Williams has been denied since the FCC rule change on March 31. "I've spent hundreds of thousands of dollars" on the efforts to purchase the stations, Williams told Journal-isms by telephone on Saturday. "It's the only recourse I have. I'm not only fighting for me. This is for all local broadcasters. It's for all those in the same predicament." The National Association of Broadcasters and Nexsar Broadcasting Group also filed petitions against the FCC action on Friday, Keach Hagey reported for the Wall Street Journal. The FCC voted 3-2 to bar most joint sales agreements and shared services agreements. A JSA, or joint sales agreement, is between two stations in the same market in which one station is authorized to sell advertising time on the other. A shared services agreement, or SSA, "allows same market stations to share resources, such as employees, administrative services, or hard assets, such as a news helicopter," as the FCC defines it. Williams' Howard Stirk Holdings planned to operate WMMP-TV in Charleston, WABM-TV in Birmingham and WLYH-TV in Lancaster, Pa., and had sought a waiver of the joint sales agreement ban from the FCC in the interests of diversity. Williams dropped his bid to buy the Lancaster station on May 12. Williams' lawsuit, filed by Howard Stirks Holdings in the U.S. Court of Appeals for the District of Columbia circuit, says, "The Court should set aside the Commission's order on the grounds that the new rule (1) was adopted in violation of the Telecommunications Act of 1996, (2) is arbitrary and capricious, an abuse of discretion, and unsupported by substantial evidence within the meaning of the Administration Procedure Act . . . and (3) is otherwise not in accordance with the law. . . ."
Ajit Pai and Michael O'Rielly, the FCC commissioners who voted "no" in the March 31 FCC vote, said in a statement Thursday, "So what has the Commission's decision wrought? Instead of increasing the number of African-American-owned television stations, we are driving stations off the air. This will mean job losses, less service to South Carolinians and Alabamians, and less ownership diversity. . . ."
However, the National Association of Black Owned Broadcasters scoffed at that interpretation. "Sinclair may have concluded that it can obtain a tax deduction from turning in the licenses greater [than] the value that an independent buyer would be willing to pay for the licenses," executive director Jim Winston said in a statement. "Alternatively, Sinclair may have determined that the elimination of competition in the markets resulting from turning in the licenses is more valuable than the purchase prices it could obtain for the licenses." "I usually just choose a few front pages for these features," Kristen Hare wrote Thursday for the Poynter Institute, "but today on the fronts of newspapers around the country, and a few around the world, there are images of Maya Angelou. "In some, she's younger, in some, she's older. She's smiling or speaking or laughing or just looking at the camera. There were many more than this collection I gathered from Newseum, but here's a handful of the day’s tributes to Maya Angelou. . . ."
Kim Pearson blog: What I learned from meeting Maya Angelou: "There's always something wanting to come." "For the first time in more than 50 years, two young wordsmiths were declared co-champions of the Scripps National Spelling Bee on Thursday night," Lindsey Bever reported Friday for the Washington Post. "However, some on social media seemed more preoccupied with their heritage than their way with words. "Sriram Hathwar, 14, of Painted Post, N.Y., and Ansun Sujoe, 13, of Fort Worth, Tex., shared the win after almost exhausting the 25 designated words in the final round. "Both boys are Indian American. In fact, the past eight winners and 13 of the past 17 have been of Indian descent, a run that began in 1999, the Associated Press reported. "The fact was seemingly too much for some on social media — who tweeted, for example, 'Where are our American kids?' . . . "
A delegation from Morgan State University's School of Global Journalism & Communication returned last week from eight days in Cuba. "We were in Cuba for a week (May 18 - 25)," DeWayne Wickham, dean of the school, messaged Journal-isms on Friday. We met with members of UPEC [site in Spanish], the Union of Reporters and Writers. "We also visited the University of Havana's School of Journalism. We met with the dean and several students and discussed the idea of some short-term faculty and student exchanges between that school and Morgan State University's School of Global Journalism & Communication. "Additionally, we interviewed black Cuban filmmaker Gloria Rolando and Esteban Morales, one of the country's most highly regarded black educators and social activists. "Baruti Kopano, chair, Department of Multiplatform Production in Morgan's School of Global Journalism & Communication, and general manager of BEAR TV, Morgan's campus television station. "Charles Robinson, reporter, Maryland Public Television." Wickham also said, "Some of the money came from members of my School's board of visitors. A couple people paid the full cost of their trip; others paid a portion." Journalist Jose Antonio Vargas, who revealed his status as an undocumented immigrant and became an activist in the immigration cause, was to be in Washington on Friday and Saturday with his "Define American" team for a screening of "Documented," Vargas' film about illegal immigration. Other film dates include New York, June 11; Las Vegas, June 16; and Orlando, July 3; all for one day. Week-long engagements in Miami, Chicago, and Denver that will be announced a few days before the run at documentedthefilm.com, according to film spokesman Cris Mercado. "Arsenio Hall's second go-round as a late-night host couldn't match his original successful run," Tim Baysinger reported Friday for Broadcasting & Cable. "After announcing in February that Arsenio Hall’s syndicated late-night talk show would be coming back for a second season, CBS Television Distribution has reversed course, canceling The Arsenio Hall Show after one season. . . ." Tweets from Hall Twitter account read, ":-( I lost my job … AND The Clippers, in a 48 hour period! #badweek … Love y'all …" and "Better to have loved and lost …"
"The executive director of the NFL Players Association said Thursday that the Washington Redskins name conveys 'racial insensitivity,' while the team launched a social-media effort aimed at rallying support behind the franchise," Mark Maske and Dan Steinberg reported Thursday for the Washington Post. "NFLPA Executive Director DeMaurice Smith offered his thoughts in a statement to The Post, issued in response to a letter sent by Native American groups to all NFL players earlier this week. That letter had asked the players to support a name change by the team. . . ."
"The National Black Church Initiative is calling for its members not to give money to NPR in response to the cancellation of Tell Me More, the nationally syndicated show that the company plans to stop producing after July," Bill Chappell reported Thursday for NPR. "Newsmax Media Inc. will look to reach politically conservative baby boomers with the June launch of its Newsmax TV channel, the company said Thursday," R. Thomas Umstead reported for Multichannel News. "Looking to compete with politically right-leaning Fox News, the Boca Raton, Fla-based Newsmax Tv channel will soft launch in mid-June on DirecTv, reaching more than 20 million viewers, said Newsmax Media CEO Christopher Ruddy. . . ."
Linda Florence Callahan, professor in the department of journalism and mass communication at North Carolina A&T State University, has been named the National Association of Black Journalists' 2014 Journalism Educator of the Year, the association announced on Tuesday. Claudia Balthazar, who graduated in May with a degree in Journalism from Hofstra University's Lawrence Herbert School of Communication, and Averi Harper, who graduated from Columbia University in May with a master's degree in Journalism, were named student journalists of the year. "The House has approved an amendment that could prevent journalists from being forced to reveal their sources," Catherine Taibi reported Friday for the Huffington Post. "On Thursday night, Congressman Alan Grayson [D-Fla.] introduced legislation that would prohibit the Department of Justice from being able to use funds to force reporters into revealing confidential sources or information. Grayson's amendment was added to the 'Commerce, Justice, Science, and Related Agencies Appropriations Act' and would open the doors for the first Federal shield law in the United States. The room erupted with applause when the legislation was passed with a 225-183 vote. . . ."
"Oprah Winfrey is the most powerful woman in media," medialifemagazine.com reported Friday. That's according to Forbes, which this week released its annual list of the 100 most powerful women in the world. Winfrey came in at No. 14 overall, the highest-ranked media person and six spots behind first lady Michelle Obama. . . ."
"The struggle between Nigerian authorities and militant extremist group Boko Haram was recently thrust into the global spotlight with the abduction of nearly 300 schoolgirls, but journalists in the country have been squeezed between the two sides for years," Peter Nkanga wrote Friday for the Committee to Protect Journalists. "Boko Haram has threatened and carried out attacks on journalists and media outlets over reporting deemed unfavorable to their cause. Several journalists have relocated from Boko Haram strongholds in Nigeria's northern regions. Others routinely exercise self-censorship, according to CPJ interviews with journalists who spoke on condition of anonymity. . . ."
"Freedom of expression advocates in South Africa are concerned that the new Ministry of Communications, announced by President Jacob Zuma when he unveiled his cabinet on May 25, will compromise the independence of the public broadcaster and serve as a propaganda office," Sue Valentine wrote Friday for the Committee to Protect Journalists. Referring to Honduras, Reporters Without Borders said Friday it was "shocked to learn that community radio journalist Hernán Cruz Barnica was murdered near Dulce Nombre, a town in the western department of Copán, on the evening of 28 May. He was shot three times in the head. Cruz hosted Otro Nivel, a daily programme about human rights in the region, for local community radio station Opoa, la Voz de la Esperanza . . . ."
"Lydia Ngoolo normally covers human interest stories for the Kenya Star, Timothy Spence reported Friday for the International Press Institute. "But when the reporter wrote about a house that some neighbours believe was once used by Osama bin Laden and continues to serve as a haven for militants, she began receiving threats by telephone. Ngoolo changed her phone number and went into hiding after the article under the headline 'Police urged to investigate old deserted house' was published in the paper on April 28. . . ."